Back of card: In hues of olive green. In the center, a diamond with an X "woven" into it. May be inverted. Booklet included: Yes, 48 pages, 2.6 x 4.4 inches, or 66 x 111 mm. Reads like a small book rather than crammed notes, a nice accomplishment. Comments: This deck was created in, and inspired by, the New Forest, in Hampshire, UK. And though that sounds like some post-WWII invention, it was actually created by Norman the Conquerer some 900 years ago. It's as steeped in English country lore as you can get. Currently, it comprises some 45,000 acres. 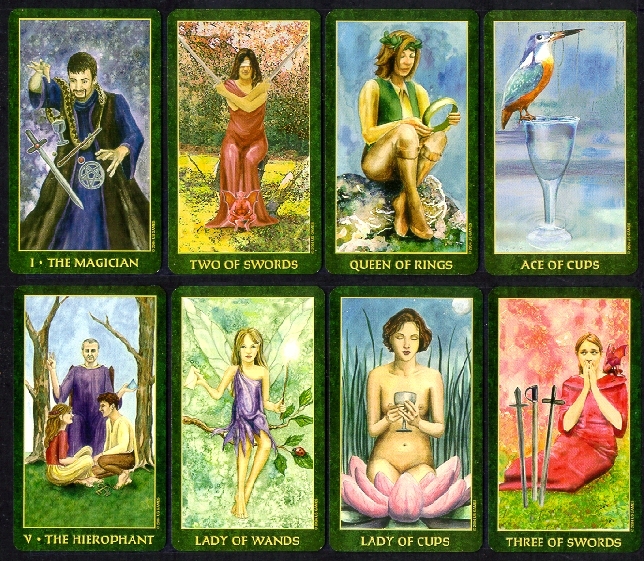 I have chosen fairies to represent the suit of Wands. Wands are a masculine suit. The fairies are primarily blonde, blue-eyed individuals. It is a suit of energy, in however manner it may manifest. This matches the character of fairies who love to get into mischief when they lack mental or physical stimulation. Water nymphs and fairies correspond with Cups. Water nymphs are sprites - beautiful young women who use their feminine ways to entrap men. It is a feminine suit. The characters in the suit have auburn or light brown hair & fair complexions. An overview of Cups shows a suit based around emotions. Swords are a male suit. It embodies aggression & conflict. I have incorporated imps into these cards as they delight in havoc & misfortune. Swords characters have dark hair & blue or green eyes. What's refreshing, to me, about this kind of discussion, is that the authors of fairy tracts seem to draw, again & again, upon their own experience in the woods & forests. Only city folk think the wee folk are imaginary. This is a very nice deck.